Typically when you think about a bunch of academics discussing environmental change, it has an air of doom and gloom. The projections aren’t promising: the global temperature is predicted to rise 0.2 °C each decade, resulting mainly from anthropogenic increases in greenhouse gases, and this will continue to result in rising sea levels and unpredictable, catastrophic weather events. Many people are left feeling hopeless with a feeling of “it’s too late.” But thanks to President Michael McRobbie’s decision to fund Grand Challenge Proposals and the ensuing advent of the Environmental Resilience Institute (ERI) at Indiana University, there is a new reason for hope in Indiana. The institute has one clear primary mission: to prepare the state of Indiana for the inevitable environmental change that it will face in the coming decades. The visionaries behind the ERI include faculty hailing from departments and schools all across the IU campus, including the Department of Biology, The Media School, the School of Public and Environmental Affairs, the Department of Geography and more. Everyone involved shares a common interest in protecting the natural world and improving the resilience of our state to the inevitable march of climate change. But to break up the mission of the Grand Challenge Proposal into more manageable goals, researchers teamed up into working groups to define goals that were of equal importance in preserving our state’s beauty and preparing the economy for environmental change, including: predicting changes in weather projections, conserving animals and plants, protecting humans against invasive species and disease vectors, promoting urban green infrastructure, and fostering better communication of future challenges (e.g. flooding, crop loss) to the communities across Indiana. 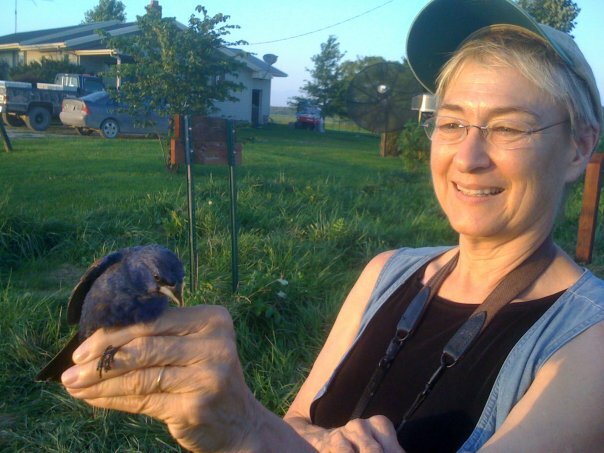 Ketterson, the director of the ERI, is a Distinguished Professor at Indiana University and a nationally recognized scientist for her work studying the evolutionary biology and animal behavior of a small songbird, the dark-eyed junco. Ketterson’s research has been profoundly influential in her field, and she serves as an inspiring role model for women in science. In addition to her work as a researcher at IU, Ketterson has great ties to the community and the state of Indiana, having spent the past 55 years as a resident. Ketterson isn’t a native Hoosier, but she finds that she’s continually discovering new things to appreciate about the history and beauty of Indiana. “I’d like to tap into the pride that [Hoosiers] do have. To not say that this is flyover country, but that it’s a really beautiful place,” she says. Her love of the state of Indiana (and the birds of course! ), as well as her sense of urgency to prepare for environmental change has served as her inspiration while working on the Grand Challenges proposal. Ketterson and the other leaders of this proposal have expansive goals, but they haven’t hesitated in getting started. Established in May of 2017, the institute has already initiated interviews for hiring six new faculty experts to prepare the state for foreseeable climate change and to fill IU’s current knowledge gaps. Some positions have already been filled, such as an expert in environmental communication in The Media School, and an invasive species ecologist in the Department of Biology. The ERI has also created a fellows program, in which scientists will be provided with labs and funding to create research programs that will address the missions of the ERI. But outside of the academic world, the ERI is also meeting with mayors and city councils and talking to ordinary citizens across Indiana. As part of its mission, ERI wants to engage communities, by collecting information about their needs with respect to the environment and conveying solutions to the current challenges these communities face. When asked whether she had hope in the face of climate change, Ketterson replied: “I see a sea [of] change overwhelming the resistance, and saying yes, for all of our reasons, for our kids, for our grandkids, for birds. We want to find a way to live in a world that leaves room for the occupants. So, yes, my hope is in the young.” Ketterson and the other ERI leaders are helping to inculcate that necessary change. Young adults in Indiana can find a role model in Ketterson for working toward community-wide changes to protect the natural world around us.